I love eating sunflower seeds, my favorite are dill pickled flavoured ones by Spitz. It just so happens that they are very good for you. Sunflower seeds boost your mood and affect your brain power. They contain thiamine which increases memory and cognitive function as well as zinc, Vitamins A and E, and omega 3 and 6 fatty acids. Because they are full of Vitamin E they are great for your skin. Vitamin E has been proven to help protect the skin from ultraviolet radiation. Vitamin E also acts as an anti-inflammatory to which is effective in reducing arthritis and asthma symptoms. 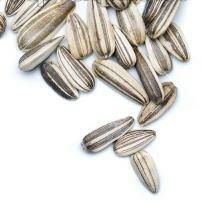 Sunflower seeds are rich in magnesium which is necessary for strong bones. Copper is also found in sunflower seeds and helps promote strength and flexibility in bones and joints. You can incorporate sunflower seeds into your diet by just snacking on them, adding them to muffins or smoothies.